British casual brand Bench was created in 1989 as a menswear brand aimed at a very specific market: those looking for skate-influenced street style. Since then the label has expanded into one that designs for both men and women and produces a very broad range of clothing and accessories based on fashionable, functional and timeless style. The idea behind the looks is to equip the wearer for a 24 hour lifestyle and this is why the designs have a function-led approach that has been developed to meet both practical and style needs. 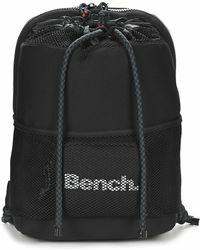 The range of backpacks from Bench features gym bags, fold top rucksacks and colourful traditional designs.